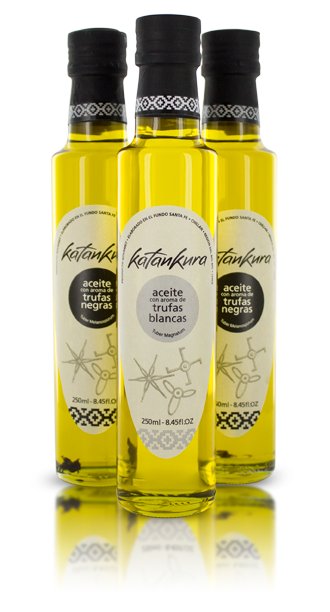 Truffle oil is top-quality olive oil that has been infused with natural truffle aroma, and black truffles. Both types of truffles have an earthy, mushroom like flavor. Truffle oil was originally created when truffles are soaked in olive oil. Before commercial truffle oil was introduced in the 1980s, chefs in Italy and France traditionally made their own by steeping tiny bits of fresh truffles in high-quality olive oil. Truffle oil is a finishing oil not a cooking oil, used to enhance foods by adding to them after preparation. Truffle oil is more of a flavoring or seasoning (that gives a burst of flavor) and should only be used lightly on your foods or dishes. The best use for truffle oil is summed up in one word, drizzle over foods. Experiment by adding a little truffle oil to some of your favorite dishes. Once open, truffle oil will keep for 3 to 6 months if properly stored in a cool dark location. The refrigerator is the best place to store unrefined oils. There are so many uses for truffle oil; it is hard to know where to start and where to stop. We have narrowed the list down to our top 10 uses for truffle oil. In most cases, you can use either black truffle oil or white truffle oil interchangeably, based on one’s personal taste preference. Our truffle oil is made with natural aroma, enhanced with a slice of real black winter truffle, and not extracted from black truffles. However, it has an excellent truffle flavor and serve the purpose of enhancing recipes with the distinct and pleasurable taste and aroma of fresh truffles. In fact, our truffle oil has more desirable truffle taste, a longer shelf life and an overall better result than pure truffle oil made only from infusing oil with real truffles. In fact, you can make truffle oil at home with high quality olive oil and fresh black truffles. Because the truffle flavor dissipates quickly, homemade truffle oil (or better truffle butter) needs to be used within a few days. The uses for truffle oils whether homemade or storebought are the same. Truffle oil is almost exclusively used as a finishing oil, meaning, the truffle oil is drizzled over a dish at the end of the preparation, usually in small amounts. The truffle flavor will be compromised if exposed to high heat. Rule number one is BE CAREFUL NOT TO OVERDO IT! The last point we will make is that truffle oil should not be used in every dish. Though there are endless uses for truffle oil, if three out of five courses include truffle oil, the charm of its unique flavor experience is diminished or even lost. Use truffle oil to enhance the flavor of fresh truffles: Summer truffles or China truffles are considerably milder in flavor than winter truffles, therefore, drizzling white or black truffle oil directly on the fresh truffle slices is one of our favorite uses for truffle oil. Make truffle oil vinaigrette: Use a tablespoon or two of truffle oil combined with olive oil, lemon juice or vinegar, salt, pepper, and Dijon mustard. Use truffle oil vinaigrette for salads with mushrooms, summer truffles, hard cheeses and dried or cured meats. Drizzle truffle oil over potatoes, pasta, polenta or risotto: Widely regarded as one of the top uses for truffle oil, the mild flavored starchy base of potatoes, pasta, polenta and risottos makes a perfect match with the flavor of black or white truffle oil. Pizza with truffle oil: Truffle oils makes a wonderful addition to pizza crust, especially white pizza. Eggs and Truffle oil: This is a great pairing. Whether drizzled over scrambled eggs or an elegant cheese omelet, eggs and truffles are a pairing not to be missed. Though fresh truffles are frequently used with eggs, truffle oil is an inexpensive way to enjoy this classic pairing. Truffle oil goes well with many vegetables: Some of our favorite combinations include asparagus, cauliflower, sweet potatoes, yams, corn, mushrooms and any type, and squash of any type. Beef Carpacio: Is wonderful with truffle oil. The combination of beef carpaccio, shaved Parmesan, arugula, or other bitter green, lemon and olive oil laced with truffle oil is heavenly. Try adding fresh shaved summer truffles, black winter truffles, or china truffles for a real treat. Finish a fish filet, filet mignon, duck breast or nice piece of lamb with truffle oil: Many types of fish, red meat, and even chicken, rabbit and other white meats pair well with fresh truffles, which means, they also pair well with truffle oil as well. Truffles popcorn, potato chips and French fries: Our list of uses for truffle oil would not be complete without this addition. After the cooking process is complete, toss the finished product with salt and truffle oil and enjoy!